Warehouse sign reseller finds it easier. “ASG has been one of my favorite business contacts to work with. We are thrilled with the success we have had working together and I would imagine it would be an advantage to work more closely. 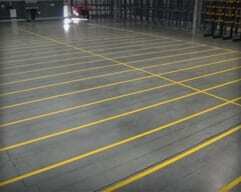 60,000 feet of shot blasted striping, provided for a worldwide logistics specialist in Mexico. 70,000 rack and bin labels, aisle markers, location signs and dock door signs. You agreed to discuss further and we had a half hour discussion, you signed up and the rest is history. You and your team delivered 24 hours in advance of your commitment in Houston… amazing in my opinion. I happened to talk to KJ today and he indicated your entire team were working like dogs to deliver. Please extend this appreciation to your entire team at ASG. Thanks for being invaluable, your efforts regarding the labeling aspect of the project with service and delivery were actually a critical component to the overall project effort. ASG Services actually delivered STRONG consulting expertise, QUICK delivery of product they had to manufacture, and EARLY completion with very favorable results. (Yes, I said that — “early completion”). When we outsource with the right resources, we truly serve our company well and have the freedom to continue selling in other areas/accounts without getting bogged down with details regarding that aspect of the project we outsourced (in this case, warehouse label consulting, warehouse custom label job, warehouse label application (they brought down a crew of two guys, lift platforms, etc. 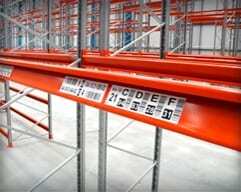 ), warehouse location signage custom job and installation). ASG has been the highlight of our project…no joking! The signs and labels are immaculate. Thank you again for everything sir! I wanted to take a moment to mention that Toby and Jason have been doing a fantastic job in my opinion, and just wanted to make sure I shared that with you. They have been a pleasure to work with, very professional, knowledgeable and have been a huge help to me in sorting through all these labels. Again, just wanted to take a moment to let you know that their hard work is greatly appreciated. If you have any questions our team are standing by and ready to take your call. Shop online to browse and purchase our solutions directly. A world renowned beverage company, focused on mass output with unrivaled performance found ASG Services, the leading provider of warehouse identification and marking products. 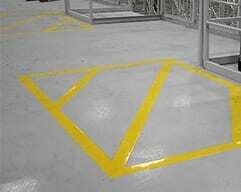 They needed a company to help with the complex delivery of floor striping, warehouse barcode signs and rack labels, all installed within a specific window. 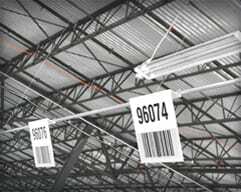 1,856 barcode signs to be used for location referencing, hung from the ceiling in a huge distribution center in California. The largest heavy-duty truck manufacturer, Daimler Trucks North America (DTNA), is now fully equipped with rack labels and line striping. The largest heavy-duty truck manufacturer and leader in medium-duty and commercial vehicles, Daimler Trucks North America (DTNA), is now fully equipped with a warehouse identification and floor marking system to beat the competition, following a premier installation from the country’s leading manufacturer and installation firm, ASG Services. 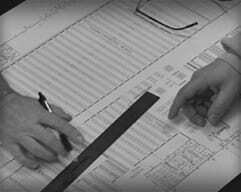 A significant reconfiguration of a large facility in Houston, TX utilize ASG Services expertise.